Machinist's Mate 1st Class Nathan Lindner was testing the newest suit designed to protect Sailors from steam leaks on nuclear-powered submarines. He pulled on thick gloves and boots, and donned a face shield for a self-contained breathing apparatus. Then he slid into the sleek, silver prototype steam suit, hoisted an air tank onto his back and connected a regulator to the breathing apparatus. Total time: a little more than two minutes. Meanwhile, Machinist's Mate 2nd Class Cameron Sebastian wrestled with the current, older steam suit used Navy-wide. First, he put on boots and a set of firefighters' coveralls, followed by the air tank and breathing apparatus. Finally, he wriggled into a bulky, HAZMAT-style chemical suit. His time: more than double Lindner's. "It was pretty dramatic seeing the differences between the old and new steam suits—especially how they affect the speed getting into it, as well as mobility," said Sebastian. Both men served on the Los Angeles class-attack submarine USS Toledo (SSN 769)—and were among Sailors attending a recent demonstration of the prototype steam suit at Naval Submarine Base New London. 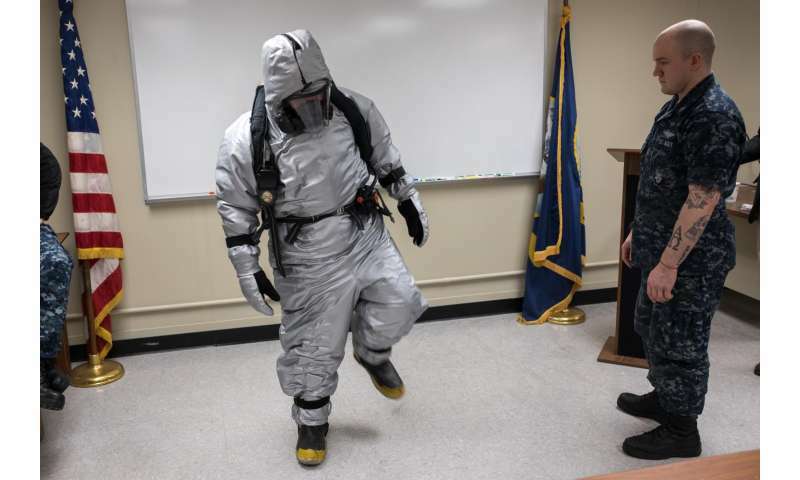 Sponsored by the Office of Naval Research's (ONR) TechSolutions Program, the new suit was developed by the Naval Sea Systems Command (NAVSEA) and Navy Clothing and Textile Research Facility (NCTRF), and currently is being tested at sea by the Toledo's crew. If pressurized steam lines aboard a submarine rupture, they can leak steam at extremely high temperatures, potentially resulting in severe injury or death. To make emergency repairs or rescue crewmates, Sailors must wear protective suits. "In the unlikely event this piece of damage control equipment is needed, time is of the essence to protect not only the individual, but the entire boat," said ONR Command Master Chief Matt Matteson. "The new steam suit provides enhanced flexibility, maneuverability and ease of donning during such an emergency." Although the current steam suits used Navy-wide have performed well since being introduced a decade ago, NAVSEA regularly receives suggestions from Sailors on how to improve them—so the command contacted TechSolutions about designing a better suit. TechSolutions is ONR's rapid-response science and technology program that develops prototype technologies to address problems voiced by Sailors and Marines, usually within 12-18 months. With TechSolutions' guidance, NAVSEA partnered with NCTRF to implement several key suit improvements. It's one piece and nine pounds lighter—cutting donning time while still maintaining protective strength. The air tank and hose for the breathing apparatus are worn on the outside, instead of under a chemical suit, allowing better access to oxygen. And there are gel ice packs to keep cool. Then there's the unique style of gloves. While the current steam suit has mittens, the new prototype features "lobster claws" with thumbs and two fingers, making it easier to grasp tools, climb ladders and navigate the close confines of a submarine. They also have leathery fabric for wiping the face shield if steam fogs it up. For the next few months, the prototype suits will be tested during at-sea drills aboard the Toledo and two other submarines. Afterward, NAVSEA will make suggested improvements and, hopefully, see the suit issued throughout the fleet in the next couple of years. And if the steam is radioactive? BTW, that boat, the Toledo has serious cracks in its hulls, including the pressure hull. Rare-earth metals are radioactive too, and are used in wind and solar farms.